Our last afternoon in Bruges had none of the glorious Belgian sunshine we had been enjoying the rest of the week, black clouds and torrential rain was the order of the day. We consoled ourselves with chocolate – loads of it. Chocolate to eat as we strolled with umbrellas aloft, chocolate souvenirs to bring home and a visit to Choco Story, a museum celebrating that great Belgian staple. Choco Story is a chocolate museum right in the middle of Bruges, quirky and housed in a typical Belgian gabled townhouse. I fell in love with that building instantly. Apparently it is the brainchild of a father and son whose family owned business – Belcolade produces amongst the finest chocolate in the world. Belcolade is the only producer of Belgian chocolate that is still Belgian owned. Inspired by two other museums – Hershey, PA and Cologne (we went there and loved it), the family acquired this beautiful three storey medieval building which was a wine tavern in the 1500’s and a bakery in the 1700’s. 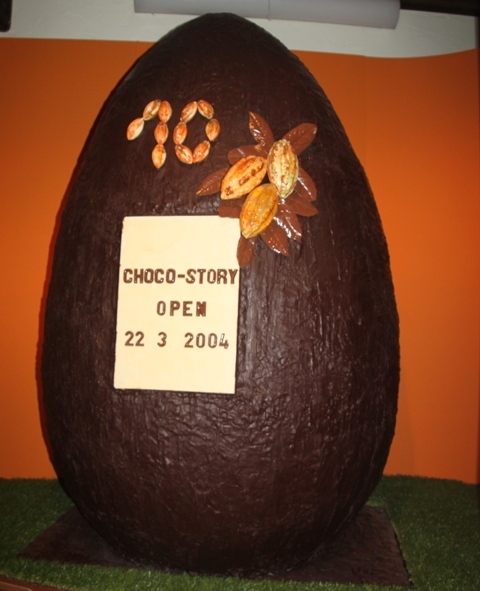 Inside the story of chocolate is told over three floors. Loads of information on the early history of chocolate going back to the Maya and Aztecs on the first floor. Next floor up was all about the properties of chocolate and how the cocoa bean is transformed into what we all know and love and then the third floor educated us on the healthy properties of chocolate. I thought it was a reasonable museum, it just did not blow me away. Everything was a little bit heavy and dry, tonnes of information to read and the fact Son skipped through most of it and seemed to be on a race to get to the end definitely did not help. The best bit was at the end. On the ground floor they had chocolate tasting. Needless to say a popular thing, unfortunately we were amongst the last to arrive and Husband and I had to cram ourselves against the back wall and watch all the action on a screen. Son wormed his way to the front somehow and got a wonderful view. A chef speaking in French, Dutch and English showed how chocolate is treated to give a shiny appearance and explained how they get a crunchy texture. We were all given a piece to try as we left and exited via the gift shop. Delicious and the best part of the museum for me. A reasonable place to visit on a rainy day in Bruges, however if the sun is shining and the weather is fair, get your chocolate fix in the shops and explore the other delights of this wonderful town instead. 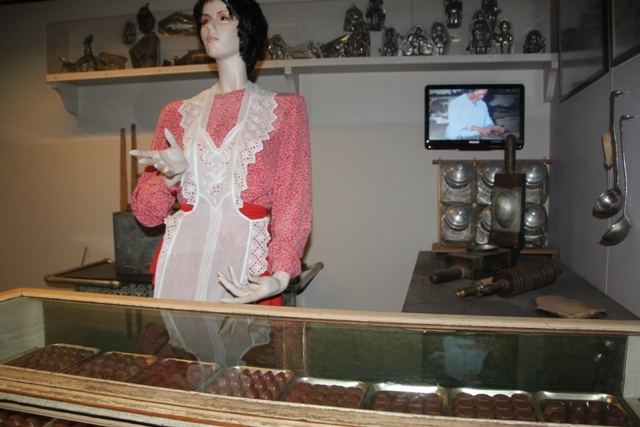 chocolate museum;) I wanted to do Choco story in Brussels but in the end we didn’t have time. But I visited a very similar museum in Prague. 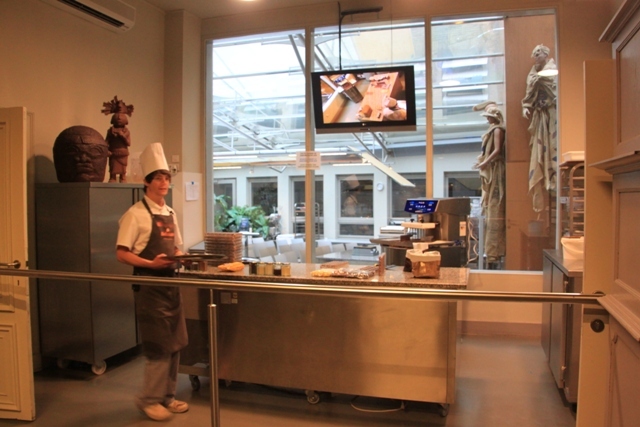 They also have chocolate making demonstration and tasting; the best part! The chocolate was delicious!! If you saw a similar one I think you didn’t miss out here Tanja – it was ok but there is so much other stuff to see and do in Bruges. Dark, pale, milky – I’m not fussed, as long as it’s chocolate I can eat it!!! This post is a nightmare – I’m on a diet! The worst thing about diets is that you crave food (and chocolate) even more…. We just got back from Bruges a day ago. We didn’t go to Choco-story, but we did eat our way through way too many chocolate shops–all delicious!! We also enjoyed the Belgian beer, and especially enjoyed a Flemish stew we tried at die Halve Maan brewery/bistro. It was a little like a rich steak and ale pie filling. I’m googling recipes now to see if I can replicate it at home. Ahhhh, Belgium. Belgian food (and beer!) is so amazing – I just love it. That stew sounds absolutely delicious, just the thing for this autumn weather!! This place and then all those chocolate shops everywhere in Bruges – heaven!! I think when I visited Bruge my entire diet was frites with mayo, beer and chocolate. All the essential food groups, right? In my humble opinion, Belgian chocolate is the best in the world. Perhaps your visit to this place explained why. I actually pine for Belgian chocolate. It’s possible to buy here but I would have to sell a kidney in a back alley so I’m now just chocolate sober. Absolutely true Laura, this are the essential food groups and we feasted (a bit too much) on all of them. I too pine for Belgian chocolate but can make do with Cadbury’s, Lindt or something else. I feel your pain…. I have never met a chocolate I didn’t like! Fun past, Joy! I’m with you on that Pam!! That was pretty much what happened with us!! Our son just dashed through with us in hot pursuit, still the chocolate at the end was good!! Yum!! A bit like our Hershey Park which we went to a few years ago. Fun, but dangerous..
Hershey Park looks like it’s probably a lot more family oriented than here, we’ve long wanted to go there!! This was a little dry but at least we got to feast on chocolate at the end… never a bad thing!! We passed this but didn’t go in – which is not to say we didn’t try out Belgian chocolate! I confess we did the Frites Museum though. 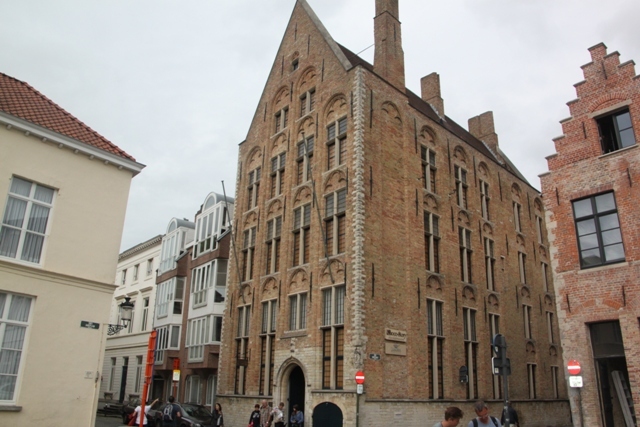 It was a toss up for us between this one and the Frites Museum – I was curious about it too. Yes, same for us but we passed this one first. Not sure your son would have been interested in the history of potatoes so yours was probably a better choice for him. It was a toss-up between this or the Fritemuseum on our rainy day in Bruges. Frites won, and like you I thought the best bit by a mile was sampling the products right at the end! 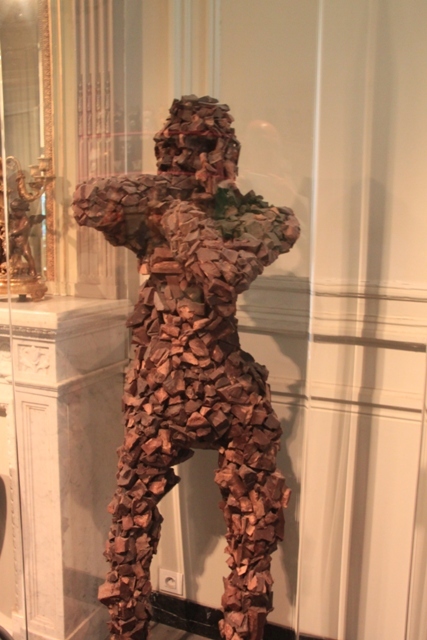 We were torn between this one and the Frites Museum too, chocolate won over chips but maybe we didn’t miss too much then!! When in Bruges, did you have a “blanche de Bruges”? A pale local beer? Oh yes, more than one and that went down exceptionally well I have to say!! I only had one. We’d driven from Paris and back in the same day. Start early, come back late. next time, I think we will stay a coupla nights. Well worth it. PLus the land of my ancestors is only 20 miles away my drop by there. Glad you enjoyed “la blanche”. If I’m ever so blessed as to get to your side of the pond again I want to spend the week-end with you guys! You go to lovely places, and have a great time no matter what the weather, lodging, or transportation! Your son will probably grow up to be a traveler, and wanderer. I blame my parents for me being a wanderer. 🙂 We traveled all the time when I was growing up, and now I travel whenever I can, and have taken my children when they were growing up, and I still do when they can get away to join me, and He-Man. I hope he does grow up to still love experiencing different places and things. I can’t get enough of travel, would do it all the time if I could!! Another place we’ll be visiting in December Joy! I feel like we are just behind you in many of our trips. Also, you made me hungry. Thanks. We, too, did the chocolate factory in Cologne, and of course, Hershey. Excellent post. Never been to Hershey – would absolutely love to go there!! Well it’s not what it used to be. The actual factory is no longer there. There is still a visitor’s center with a ride and they simulate making chocolate. You can still get a sample though and that’s always nice. I’ve never seen anything like this, and it makes me want chocolate soooo badly! It was so interesting to watch them make the chocolate at the end – and then taste it of course!! The best bit!! The taste test is always the best part! Chocolate is always good George, you can’t go wrong with the stuff. I’m not familiar with this brand of chocolate. Is it worth the expense of having it shipped overseas? It was good, but to be honest no better than any of the (vast quantities) of other chocolate we sampled there!! But then all chocolate in Belgium is divine. I love this post. Bruges has the most incredible chocolate! I could literally spend hours in their shops. Me too!!! I think we did just that!! Yum! The museum sounds like it needs a modernization to make it more engaging but, as long as they give out chocolate at the end, people will come! Absolutely, and that chocolate was so good!! That chocolate at the end saved the day Rosemary!! You would have thought by the last day we would have eaten our fill of chocolate, we couldn’t get enough of it!! Hope your weekend is fun filled too. We’ve just arrived in Florida for our 2 week half term, so nice to feel some sunshine!!! This time of year is just perfect Rosemary, like you say not so humid but plenty warm enough!! Looking forward to some exploring…. Definitely!! Chocolate always brightens up the day! 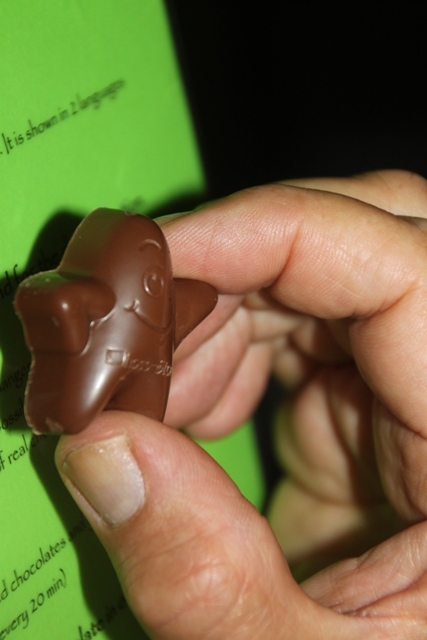 Oh my goodness, I love Belgium chocolate – this sounds like my idea of heaven! Belgian chocolate is the best Susan, there’s just nothing like it!! My mouth is watering just thinking of Belgian chocolates! Yummy! I know – it’s the best!! Take it from the experts who sampled far too much of the stuff!!!! Chocolate endings are the best! 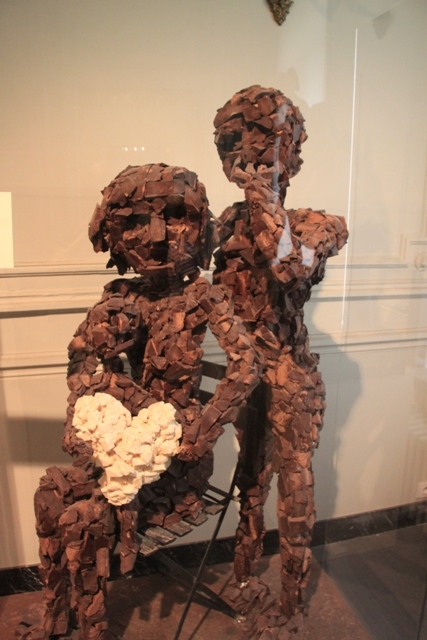 I love your story about chocolate in Bruges. I plan to go there in January. Not the best time to visit but good for museums and churches — and chocolate! Any time is a good time to visit Bruges I think!! If it rains there is always chocolate!! Hope you enjoy.